This recipe makes two of these! This recipe is rather fitting for a Christmas morning in Florida. While my mother doesn’t grow tangerines, she does grow a variety of lemons, oranges and grapefruit in the yard that I enjoy while I’m home. 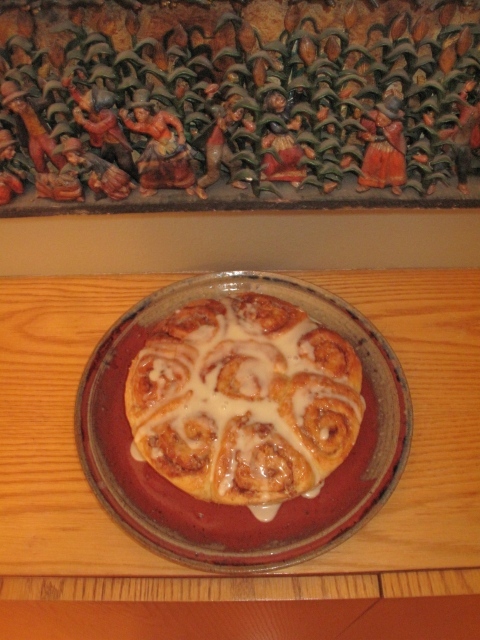 This is the second year that I’ve made this recipe for Tangerine-Glazed Cinnamon Rolls. I found the recipe several years ago in the late Cottage Living Magazine (which I miss dearly) and I’ll saved it in an email since then (those folks at Google seem to save Christmas every year). This year we added chopped pecans which I highly recommend. minutes; Stand: 2 hours; Bake: 20 minutes. teaspoons), and salt in bowl of a stand mixer fitted with a paddle. until warm to touch. Add 6 tablespoons butter, and allow to melt. place about 1 1/2 hours or until doubled in bulk. almost doubled in bulk, about 30 to 45 minutes. Preheat oven to 350°.